Especially for all my Elmwood friends! I do not take it lightly that you have taken me into your fold! Hope to spend many more evenings being real with you. Did you ladies go home feeling as full as I did last night? Not from Alicia’s delicious Lemon Cake with Cream Cheese Frosting but full in your heart? Did you walk in your house feeling like you had something to give your family? I did and it was awesome. Just knowing that you guys are reading the same scriptures as me pushes me closer to Him. You encourage me! I need this kind of accountability. So…today was the Lost Sheep of Luke 15:1-7. Did you love reading Jesus’ words? Do you have some thoughts you want to share? Luke 15:7 NLT – In the same way there is more joy in heaven over on lost sinner who repents and returns to God than over ninety-nine others who are righteous and haven’t strayed away! Jesus always preferred the company of “sinners”; people who weren’t trying to impress Him. I think that is still true for us today. I always feel a more intimate connection with Jesus when I recognize that I don’t have to impress Him. I think He can tell when I’m “church’n’ things up”. You know, showing off my good side and not acknowledging the dirty parts of my life that He wants to tend to. It’s hard to be vulnerable and real. But if there was ever a safe place to be vulnerable and honest, it is at the feet of Jesus. Remember how I wanted to pull away from Jesus…recoil from Him. I think we do that because we aren’t sure if we can trust Him. We don’t think He will like what He sees and that maybe He’s just gonna shame us. Re-read Luke 15:5-7 and tell me if you think that Jesus would shame you. It is because of Jesus, our Savior that we can stand before God, The Judge. We need cling to Him! Here are some fun facts about sheep to ponder… remember now, we are the sheep! Have fun, bless you all! Email or share your thoughts in the comment section. Sheep are actually quite relationally intelligent. In studies, sheep can visually recognize up to fifty individual sheep by photo. They also have strong emotions and frail hearts: sheep feel pain over the pain of other sheep in their flock. In fact, when one of its sheep-friends is in distress, a sheep can literally kill itself with worry because it can’t do anything to help. All it can do is to cry out for its Shepherd to come rescue its friend. Sheep are Defenseless, Directionless, and in all ways Dependent. No other animal is so dependent on someone else to take care of it. Its wool, for instance, has to be sheared regularly, or it becomes matted and overgrown, and debris accumulates in it. As a result, the sheep can become overheated and top-heavy; and when a sheep gets top-heavy, it easily lose its balance and falls over—a position from which it is unable to escape on its own. Once a sheep is on its back, it is stuck there until someone finds and rights it, until it starves to death, or until a predator puts it out of its misery. All sorts of things can cause suffering for a sheep. Flies will gather on its face and can drive the sheep insane. In an effort to relieve itself of the constant annoyance, a sheep will hit its head against tree stumps or fence posts, sometimes causing its own death. To prevent this, the shepherd will smooth oil around the sheep’s eyes, nose, mouth and ears to repel the tiny Death Files. Parasites will burrow into the folds of skin beneath the sheep’s wool, lay eggs and cause infection. The shepherd must investigate every inch of his sheep’s’ bodies, and will pay that same tender, meticulous attention to each one. Sheep are also prone to overeating, over-drinking, and slothfulness. The shepherd carefully weeds dangerous plants from the pastures to which he leads them, and often wakes them early in the morning when dew is on the grass so that they can hydrate and eat all at once. He takes individual walks with those he notices have been inactive. In their dependence, sheep are also directionless. 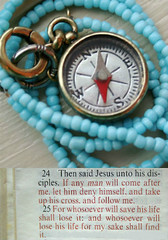 [1 Peter 2:25] They seek a leader to follow, even if it’s just another directionless sheep. (In Turkey in 2005, 1,500 sheep followed one wayward sheep off the edge of a cliff while their shepherds were having a lunch break!) Sheep also get overwhelmed and paralyzed when given too many options to choose from while traveling to new pastures, or when the path seems scary. The shepherd knows to show them clearly which opening to go through and which steps to take. Sheep are dependent on a shepherd for defense as well [John 10:12]. They have neither defensive nor offensive weapons; they don’t even have front teeth. Sheep are prone to heart attacks if terrified, and can become too scared even to bleat. Should the sound of a predator be heard, the eyes of all the sheep will flash to their shepherd. [Exodus 14:13-14] They know they are helpless without him.